There was an increase in the number of residential properties Barfoot & Thompson auctioned last week but the sales rate was almost unchanged from the week before. The agency marketed 172 residential properties for sale by auction last week (8-14 April), up from 154 the previous week, and achieved sales on 39 (23%) of them, almost unchanged from the 22% that were sold the previous week. Most of the unsold properties were passed in for sale by negotiation, which would usually make them available for offers from conditional buyers, although a few were withdrawn from sale or had their auction date postponed. Of the major auctions where at least 10 properties were offered, the highest sales rate was at the Manukau auction where properties from south Auckland and Manukau's eastern suburbs were offered and the sales rate was 29%, while the Shortland St auction on April 12 where most of the properties offered were from west Auckland, and the North Shore and on-site auctions, all had sales rates of 19%. 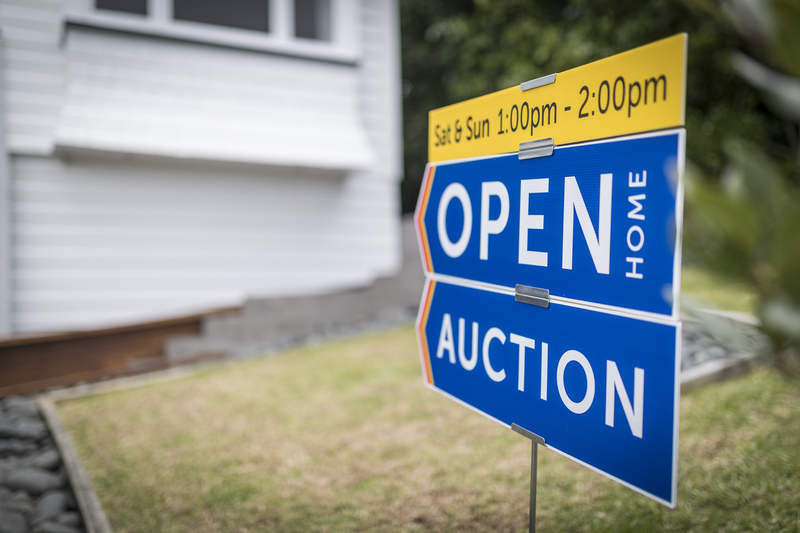 There were no sales at a couple of the smaller auctions, at Kerikeri and the Shortland St auction on April 9, where the properties offered were from central fringe and west Auckland suburbs. So auction sales remain subdued and over the last couple of weeks Barfoot's overall auction sales rate appears to have settled at just under a quarter. See the table below for the full results, while details of individual properties offered and the prices achieved are available on our Residential Auction Results page. If the housing market was a dead cat, we have just passed the eighth bounce! 3% Nationally but actually when it was nearer 20% in the most affluent suburbs that goes a very long way to spreading the issue of over-leverage nationally once the central Aucklan premiums are passed on. 'Marginal' buyers were created across the nation. Realestate.co.nz, listing for Auckland appears to have stabilized at around 14,311. Yet Waikato-Hamilton has kept rocketing up - 2841. Looks like the chill is spreading south. Like Auckland, Hamilton property valuations ride at an unsustainable altitude. Probably more so. No, Auckland has peaked and listing numbers are declining fairly steadily. Sell at a loss or be a mortgage prisoner? Tough choice. The vast majority of house owners will stay put - and reap big rewards further down the track. A house is a much-coveted asset. Once a house owner, people like to maintain that status. How much of that is seasonal? No idea, I don't have data for previous years. I expect now that we are past the summer selling season a fall off would be normal, but would love to know if its falling faster or slower than the past. Doesn't really matter, next months RIENZ figures will answer the question, are listing dropping because they are selling, or frustrated vendors dropping the listings off the market. I guess for those that cant sell during summer for what they want, no point sticking it out for winter. I notices a house close by that had been on the market for 6 months has gone off the market. For those that are more motivated to sell will be digging in for a long cold winter. Or is it sellers constantly"testing the market" to see if it has recovered yet? Don't question the validity of TTP's good-vibes analysis that clearly points to 2021 as an inflexion point. Then following the well founded Ashley-Church-Theorem(1) of "past performance is a guarantee of future returns" we will see the market double again to 2026. (1) The Ashley-Church-Theorem is based on a stroke of genius whereby you simply extrapolate your own interpretation of NZ property price trends over the past 30 years, at all times remaining totally myopic and ignorant to any global macro-economic factors that may unnecessarily cloud your simplistic intellectual prowess. cmat, well said :) A recovery in 2021 is as likely as a broomstick sprouting flowers. Unbridled negativism would be an unlikely formula for success in achieving one's house/home ownership ambitions. Who, here, has said there will be a recovery in 2021? You did. You even referred to it as an "upswing"in 2021. You're either forgetting what you post or you're about to to a major backtrack. Which is it? Go read my post above (and others in previous threads). I have consistently maintained that, "I don't anticipate the next upswing will eventuate before 2021 - at the earliest." You have a bad habit of misquoting people - which is unethical. Assuming upswing starts 2021 then 2024 they'll reach the levels of the 2016 high and in 2028 they'll be double what they are now. Blobbles, yes auctions seem like a waste of time now, and quite unusual internationally to have auctions at all really. It's likely that it's the agents managing to talk those vendors into an auction, in order to force a quicker sale. The property will still likely sell even if not on auction day, and the prices are likely a lot lower than the vendor expects. You write, "....... and the prices are likely a lot lower than the vendor expects." With all due respect, you need to be careful about making statements that you can't substantiate. Agent TTP, why the veiled threats? When called out, what are you ever able to substantiate? VOR is entirely correct. Auckland median prices are indeed falling (latest -2.7pa) and "prices are likely a lot lower than the vendor expects" In this buyers market, vendors are slowly discovering the need to be more realistic! Of course people want their current CV, and increasingly that seems not to be happening in Auckland. Is it unjustified to comment on an article written about a 23% auction clearance rate that vendors expectations appear to be above those of the buyers? 23%. These numbers are getting too low. We need a property spruikerman to save us. 50% at one auction! Things are picking up! It was really 100%, the other two were withdrawn.. but being mortgagee auctions they went 20 and 30% below RV. The two 0% auctions balance it out.. If you remove the Mortgagee Results (obviously an outlier) then the total clearance rate becomes 22%. Is this to be the housing winter of our discontent? Or will prices settle down nicely? I'm glad I'm not selling this year. I'd rather be selling this year than next year, personally. We need far more Ashley Church and Tony Alexander. Put them on TV 24 hours a day and let's get this party started again. Don't forget the 3% Chinese buyers who have gone missing, we'll need them too. Although we've been told that they had a minuscule effect on the market anyway. Now I'm just wondering, where will all the money come from? Never fear, Ashley is back at Oneroof, the Ministry of Housing Propaganda. The Title of the Article - New Zealand risks becoming a nation of mortgage prisoners...and yet Ashley hasn't considered that if large numbers of people (30's 40's) choose not to be mortgage prisoners at the top of the cycle then there are plenty of sellers entering retirement with mortgages who may need them anyway, even at lower prices... That way the next generation of retirees don't face that risk themselves. There are good bits in this Oneroof report and it looks like the University of Otago have been getting some of their thinking from alternative sources. Good point, not feeding this monster of a bubble is the best long-term investment for young people. In addition to that, looking at the latest median price stats (AKL down 4+ percent), not buying a year ago saved me more than my annual rent. And that's just the capital loss, it doesn't include mortgage interest and other costs associated with owning a home, not to mention the opportunity cost (I kept my deposit-money in term deposits). A casual look at the Auckland sales volumes for March 2019 shows approximately 2/3 off the peak March volumes of 2015, despite the significant increase in the overall housing supply since then. 104,000 sales in the 4 years either side of the end of 2016 market top or in other words around 20% of the rooftops who, if they wanted to sell, would face the risk of a loss against purchase, without acounnting for the associated selling costs. Many of these won't have to sell, but the market of houses that real estate agents can actually sell at prices owners may want to consider, is already going to be about 20% smaller than it was in 2016. Best guess is that at current trends, the volume of sales will fall to between 15,000-17,000 sales this year so things are about to get pretty tight for RE commissions. FYI, since 2001, the lowest volume of sales in Auckland was 16,190 as per REINZ numbers - that was in the 12 month period ending February 2009. Remember that in February 2009, there was the Global Financial Crisis and the New Zealand economy was in a recession, & the unemployment rate was rising to over 6%, and there were a large increase in mortgagee sales. Current economic conditions are GDP growth of 2.3%, & a relatively lower unemployment rate of 4.4% (having recently bottomed at 4.0%). In this economic environment, Auckland house prices are down from their peak of about 3-4%. What will happen if there is a recession in New Zealand, and there is an increase in mortgagee sales? Market is down but not overall because of interest rate. For the market to fall much - it has to across and not just selectively few. By April we would have know and knows, the direction of the market and now by July will know how bad the correction is so far. FHB should wait and watch if they do not want to burn their deposits or % of their deposit. First step is fall in volumes followed by drop in price. Volumes have dropped and prices have started to fall. Still much fall is yet to come. This is just the begening of the end. "Just under 25%". Fair comment. But 0.18% before the headline would need to be rounded down to "Just above 20%" instead of up to "Just under 25%". So out of curiosity - does anyone else get updates from Homes.co.nz on the value of their house? It was all working great last year as their value of my house increased from GV by about 3.3%. However, since late last year I have continued to get notices that the value of my Auckland/Glenfield house has dropped in price. Now it is saying that I am 12.2% below GV (drop of 5% last month = ouch). Is it that they have a really great crystal ball or are they seeing things that NZH nor anyone else can see? I know that in Glenfield last month only 1 house of 11 sold at auction, and that was 7.8% below GV. It's all a little unclear to me, and disconcerting. If it's your home and you intend on staying, why does it matter?